Added support for the umbrellas that came with Seasons. This version will add the necessary tuning resources to work with the Sims 4 Studio Accessory Enabler. 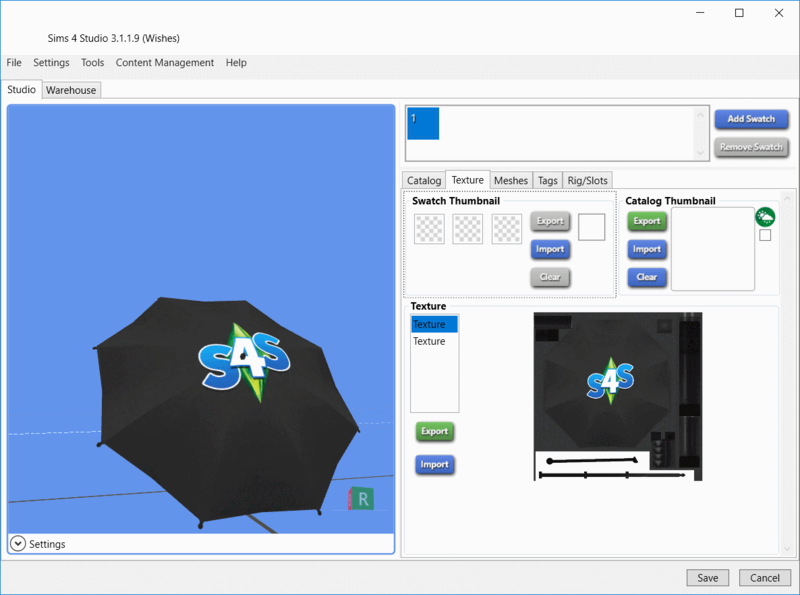 You will need the S4S Accessory Enabler in your mods folder for your umbrella to work in the game. Also new is the Color Palette tool. 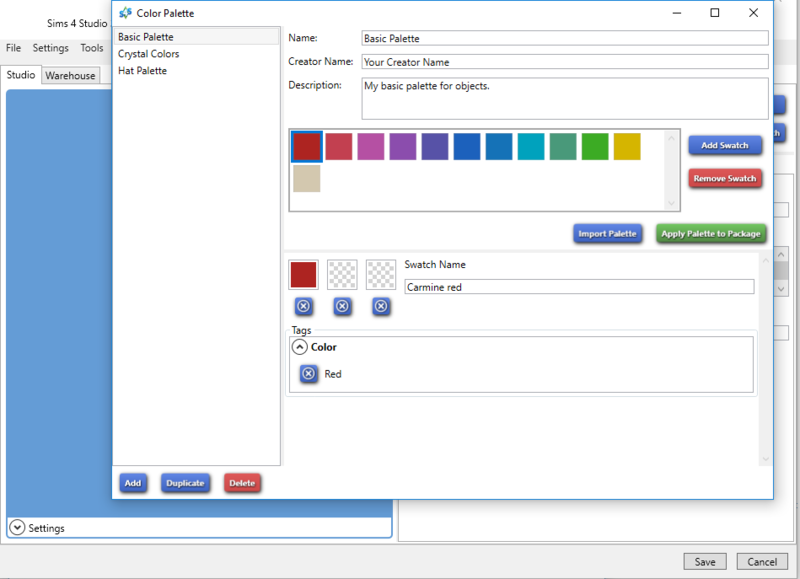 This tool will allow you to save the colors and color tags from a package as a shareable, re-usable color palette. For more information about this feature, see the tutorial HERE. If you have comments about the new feature, please post them HERE. Thank you to simtress and juliej for getting us the resource needed to enable Studio for the Fitness Stuff Pack and testing to make sure it works. Thank you to Renorasims for getting us the resource needed to enable Studio for the Toddler Stuff Pack and testing to make sure it works. Thanks to all who have reported Pets-patch-related issues, especially Kaizoku-Gal for drilling down on the problem with CC hair. Thanks also to tuco for pointing out the need for a Screenshot Manager. No other site can offer the same level of knowledge when it comes to teaching you how to use Sims 4 Studio or troubleshooting problems you encounter while creating something with it so if you have problems with or questions about Sims 4 Studio please ask at Sims 4 Studio forums! The Tutorials Forum and the Creator Help Forum are staffed by nice people so don't hesitate to post if you run into questions or problems while creating something using Sims 4 Studio. If you have questions about how to use the tool or the project you are creating post here. To modify meshes or animations, you will need to have Blender 2.76 installed. Blender 2.70 will continue to work with Studio as it has in previous versions, but no other Blender versions are supported by Studio. Like the tool? Great! There are many ways that you can show your support for the Studio project: Share your creations in our upload section, help another creator out in the Creator Help section, write a tutorial showing how to make things, post screenshots and vids of your stories and builds. + Fixed a bug with the last version that made tuning extraction to a folder crash. + Added support for custom tags with 32 bit values. + Added a way to edit an unknown value in the Cutout Info Table resource. + Object swatches with duplicate variant ids will be skipped when creating a recolor. + Umbrella overrides will not include extra tuning to be included as a custom umbrella. + Fixed an issue that occurred when editing a mesh that caused the normal map to stop working. + Floor thumbnails are auto generated from the diffuse texture. + Roof thumbnails are auto generated from the diffuse texture. + Wall thumbnails are generated from the short wall diffuse only. + Wall textures imported as DDS with the auto-resize option off will not go through any image format conversion. + Added the updo tag. + Added support for Rabbit Hole, Headline, Career Gig and Narrative tuning types. + Fixed an issue when using the "Restore tuning comments" tools option when there were custom tuning references. + The selected item will stay in view after sorting. + Fixed an issue where selecting to batch export to .package caused Studio to continue using .package even if you tell it not to. + Fixed an error when saving the Region Description resource. + Updated tag list with the latest patch. + Updated shader list with the latest patch. 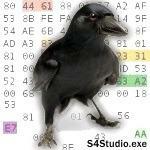 + S4S should now be large address aware (is able to use more memory before getting an out of memory error). + Added keyboard shortcut Ctrl+Shift+S to save as. + Fixed an issue with objects using the AnimatedTree shader that caused them to be invisible in the game. + Update shader list for Seasons. + Studio is now Large Address Aware (Can use more memory before crashing with an out of memory error). + Fixed a bug from changes made in 3.1.1.9 that makes most SimData resources not save. + Non-override clone options will exclude Uniform tags. + Added support for the S4S Accessories mod to umbrella packages. + Fixed a bug that could occur when adding a swatch on some items. + Added support for the new tuning types added with Seasons. + Fixed a bug where the "u" value in the root of a SimData xml would not get saved. + Added a Brazilian Portuguese language option (Not yet translated, just a copy of the Spain one). + Updated most of the "World" resources that were previously supported for seasons. World Object Data is still broken. + Added basic support for the Terrain Mesh resource. + Fixed a bug with the swatch order of the first swatch after applying a palette to a package. + Added a batch fix to add the Hot/Cold tags to clothes for seasons. + Batch fixes now include a text file by the backup folder with a list of things that were changed. + Updated for the 6/19/2018 patch. + Added the Cooler, Heater, Can be struck by lightning, and Never receives snow tags. + Updated the Object Catalog resource for the patch. + Updated mesh resource for the patch. + Updated the Terrain Paint and Roof Pattern resources for the patch. + Added the Hot & Cold weather tags. + Full tag list updated for the patch. + Tuning extraction should no longer give an error related to object changes in the patch. + Fixed a bug from 3.1.1.4 that caused an error or a squished mesh to be imported when the new mesh is significantly larger than the original. + Fixed a bug where applying a color palette caused the last swatch to show as the default instead of the first. + Added a warning instead of a crash when attempting to save a color palette with an invalid file name. + Added a more informative error message when saving a package with Sim Data resources that have syntax errors. + Added an option to enable the pack icon on all swatches (checkbox to the right of the catalog thumbnail on the Studio tab). + Moved package merging, screenshot management and batch fixes from the "Tools" menu to a new "Content Management" menu. + Added a menu option to un-merge package files. + Speed and memory optimizations to the Color Palette tool. + Added a color palette tool. + Updated tag list for the latest patch. + Fixed a crash when opening a build item that has referenced textures. + Added the hair color tag to the Studio tab for eyebrows and facial hair. + Fixed a bug that caused additional swatches of items cloned with 32 bit instance numbers to not have 32 bit instance numbers. + Fixed a bug that caused imported shadow LODs of windows to not show the correct shadow in the game. + Fixed a bug that could sometimes cause Studio to crash after closing an object .package. + Fixed some German text issues where chairs were labelled as tables. + Added an option to select a different folder if your screenshots are not in the default folder. + Updated the "Fix Objects for Cats & Dogs Patch" batch fix to include objects that were broken with the December 12, 2017 patch. + Added a batch fix that fixes alpha hairs that were broken in the Cats & Dogs patch. + Updated the Cats & Dogs object batch fix to include toilets. + Added a new option: Screenshot Manager. 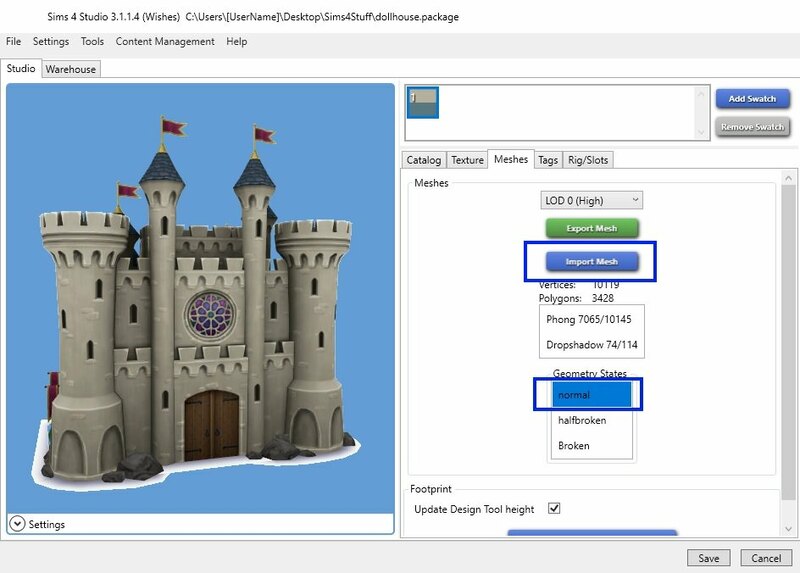 This allows you to view and edit in-game screenshots. + Updated shader field list. + Added several new resource types and updated some to the latest patch version. + Fixed an issue with the world color timeline resource. + Cats & Dogs object batch fix now fixes benches, sofa overrides, and 6-seat round dining tables. + Cats & Dogs CAS batch fix now fixes mesh distortions that were introduced with changes in this patch. + Added support for World Color Timeline & Sky Box Texture resources. + Updated for the pets patch. + Fixed an issue that caused non-adult blank blends to be exported stretched to adult size. + The disallow for random batch fix now also removes uniform and style tags that caused them to show up on random sims anyway. 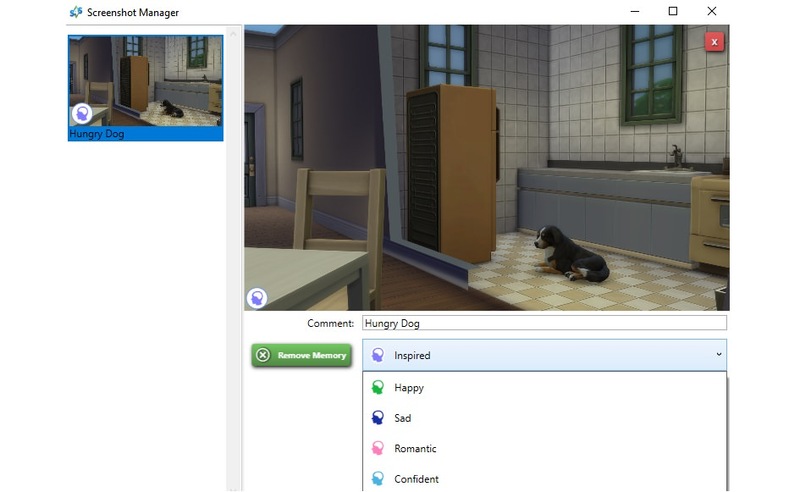 + Updated Sim Data to work with the pets patch. + Added support for the Sickness,Breed, CAS Menu, CAS Menu Item, Relationship Lock and Household Milestone tuning resource types. + Fixed some issues that could cause Studio to crash while switching swatches. + Added a right-click option to turn off swatch re-ordering. + Fixed an issue that caused the "Help>Windows Event Logs". + Added an option to the Tools>Modding menu to add DLC pack requirements. + Fixed a bug in the German translations that caused CAS tops and bottoms to be switched. 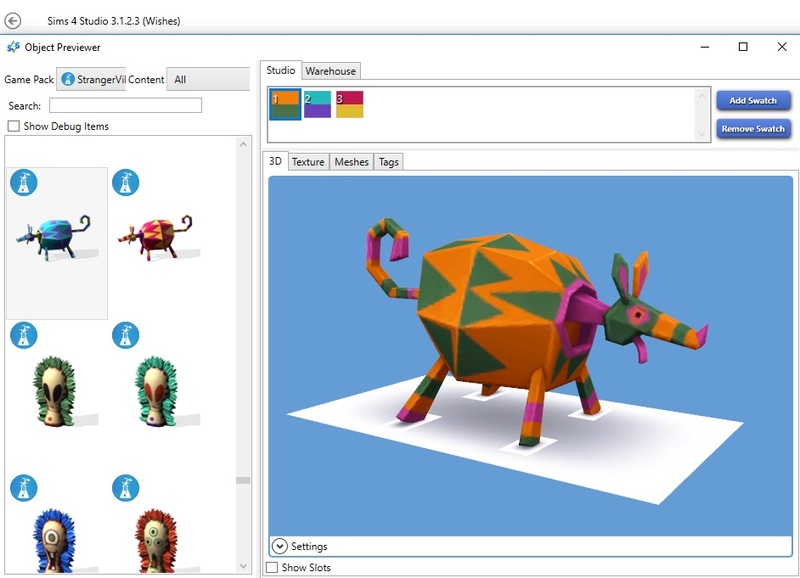 + Added the option to change the background color of the model viewer. + Added the option to disable the grid in the model viewer.